A paycheck is a check issued by an employer in order to satisfy the compensation commitment the employer made with the employee when the employee was hired. The paycheck is usually issued every two weeks, although some employers issue paychecks weekly or monthly. Salaried or exempt employees generally receive 26 paychecks a year with compensation paid in equal installments. In an all-salaried organization, time recording or time clocks are rarely required. The assumption is that every employee is earning the salary that they are being paid. When issuing the paycheck to an employee, the employer is legally required to withhold a certain percentage of the compensation to pay income tax and social security. The employer regularly sends the amount withheld, and additional social security paid by the employer, to the I.R.S. This gives the I.R.S. an accounting of what you were paid and how much money was withheld. When tax time rolls around, the I.R.S. can check your tax return against the records it received from your employer. The employer may withhold additional amounts of money from the paycheck when the employee is required to pay for a portion of the benefits plan. Paying for part of the cost of health insurance is one example. Additionally, employers must withhold wages to comply with wage garnishment ordered by a court. A paycheck stub is also known as a pay stub, pay slip, or earnings statement. It is the part of the paycheck that documents how much money employees were paid and is usually attached to the employee paycheck with a perforated page. When the employee deposits or cashes the paycheck, he or she can easily tear off the paycheck stub for personal record-keeping purposes. Paycheck stubs provide the details of the employee's pay and the exact deductions that were made during each pay period of the year. Gross pay: The amount of money the employee was paid before the employer took deductions. Net pay: The amount of money the employee receives after the employer takes out deductions. Local taxes withheld if any. Many local areas do not charge taxes. The paycheck stub may also include information such as year-to-date totals of gross and net wages and deductions. Many employers use the paycheck as a communication tool. The paycheck stub often tells the employee how much vacation time, sick time, or paid time off (PTO) was accrued during that pay period. It may offer a cumulative accounting of time off used by the employee. 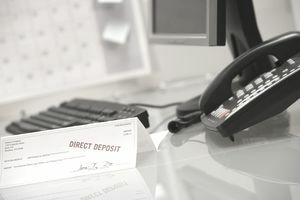 Since employees traditionally received their paycheck in an envelope, reminders, updates, and newsletters were regularly inserted in the paycheck envelope. This type of communication has become rare as employers most frequently require that employees maintain an account into which the paycheck is directly deposited on each payday. Information that was communicated on the paycheck stub is now visible in your online account and on your internal benefits website. Although some employers initially provided a traditional paycheck stub as they made the transition to the online world, few do so anymore. Many organizations use a third-party vendor such as ADP to process employee paychecks. Employees have access to their records on the third-party website. The third-party processors are experts at producing paychecks so companies often outsource this function. Garnishment is the process of taking money from an employee's paycheck to pay off a debt that the employee owes. The garnishment is usually the result of a court order or a tax collection. The employer is required to cooperate with a wage garnishment order. When wages are being garnished, the employee has the money owed deducted from his paycheck until the debt is paid off or until the employee makes other arrangements to pay off the debt. Certain limitations on garnishment exist. In most cases of wage garnishment, 50 percent of the employee's paycheck is the limit for garnishment for child support if the employee has another spouse or child to support. Without a spouse or another child, the limit is raised to 60 percent and another 5 percent can be deducted for back payments. Various states have their own guidelines for wage garnishment. These guidelines may limit the reasons for which an employee's wage may be garnished. They may stipulate a different maximum garnishment than the Federal law. They may exempt employees from garnishment because of certain responsibilities for child support and other restrictions. Because employers must follow legal guidelines in garnishment, employers must know the garnishment laws in their state. As employers are often faced with multiple garnishment orders for a particular employee, knowing the maximum amount that can be deducted from an employee's wages is critical. Understanding the order in which creditors must be paid is also important. For example, if an employee was being garnished for Federal taxes, state taxes, and credit card debt, the employer would pay in that order until the maximum percentage was reached. An employer is informed of garnishment requirements through a legal document or court order with deadlines stipulated in garnishment. Employers often inform their employees of the arrival of a garnishment order. This allows the employee to plan for the receipt of a reduced amount of compensation in his paycheck. Why Do You Need a Social Security Number for Work?